Machining and CNC Technology is the first text written to fully integrate basic machine tool and CNC concepts throughout. 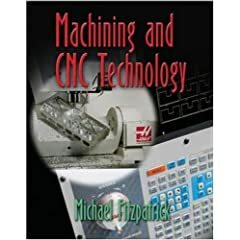 Beginning in the first chapter, the differences between manually-operated and CNC equipment are shown and compared. The text is written for introductory courses, and does not assume previous machining background on the part of readers. Part I discusses the basics of today's integrated manufacturing world. In Part II students learn to safely set up and run manually operated equipment, always with the goal of transferring their skills to CNC systems. This part covers setups, safe operation, faultless program tryout and program writing, both with command codes and using CAM. CAD/CAM exercises are provided on CD-ROM, using the Mastercam® software program (student version). Finally, Part IV focuses on the future, highlighting technologies that have changed, and will continue to change, our manufacturing world.